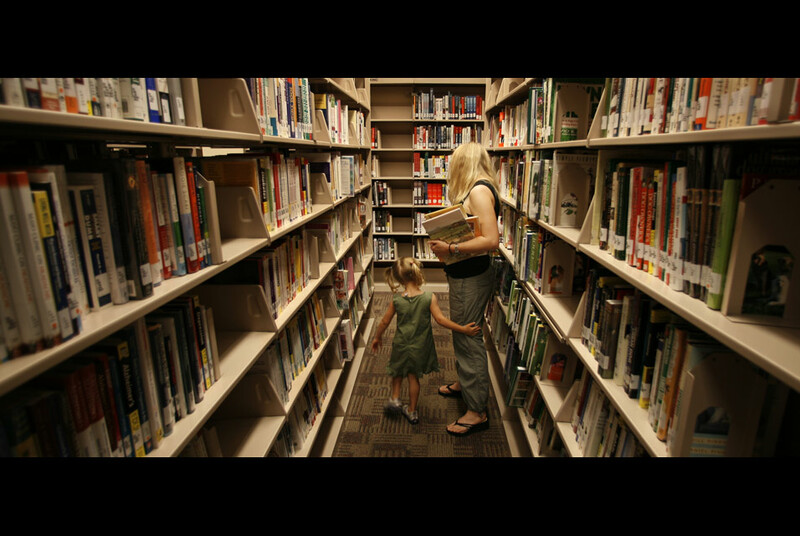 Area residents browse the Bucktown-Wicker Park branch of the Chicago Public LIbrary, in Chicago. AP Photo/M. Spencer Green. CHICAGO, IL.- The increasing demand for library materials and services continued unabated in 2010. As more Chicagoans felt the effects of the economic downturn this year, they continued to turn to their neighborhood libraries for free access to computers, books, movies, music, programs, information and entertainment. All 76 CPL locations continue to be stocked with the latest books, magazines, online databases, free WiFi and speedy Internet access through new and upgraded computers. And Chicagoans clearly know this: more than 1 million patrons visit a Chicago Public Library location each month to use computers; seek reference assistance; check out a book, audiobook, DVD or video; attend a technology class; read in a quiet setting; participate in programs; and view exhibits. During the first 11 months of 2010, CPL circulated more than 8.8 million items  books, CDs, DVDs and downloadable media  and provided more than 2.8 million free computer sessions to the public. As layoffs touched the lives of more Chicagoans in 2010, CPL librarians and CyberNavigators reported that more than 60% of the time they spent with patrons was devoted to searching and applying for jobs on the Librarys free computers. To aid in those searches, CPL staff developed an Especially for Job Searchers section of the Librarys website (www.chipublib.org), a virtual self-guided career counselor with advice on finding job openings, writing a resume, developing interviewing skills and such. In 2010, thousands of Chicagoans attended free financial literacy programs to learn how to better manage their finances, save for college, avoid foreclosure or prepare for retirement. Working in cooperation with the Department of General Services, the Library opened the new West Town Branch at 1625 W. Chicago Ave. in September. In its first month of operation, this branch circulated 10,000 items. Thanks to a partnership with the Chicago Board of Education and the Chicago Housing Authority, the new Altgeld Branch opened in November, replacing the former branch which was forced to relocate due to building deterioration. Working in cooperation with the Public Building Commission, construction is nearing completion on new branch libraries in the Dunning, West Humboldt Park, Greater Grand Crossing and Little Village neighborhoods. All projects are scheduled to open in 2011. These new state-of-the-art, fully equipped branch libraries will replace inadequate storefront facilities, or bring library services to neighborhoods which previously had none. This year, the Library completed its current five year plan, CPL 2010 and prepared to begin its next strategic planning process in January 2011. This planning process challenges CPL to create and maintain a library system that enhances the lives of the people of Chicago while also providing state-of-the-art and visionary library services that will ensure Chicago a primary place in the global economy. Working with the Citys Department of Innovation and Technology, in 2010 the Chicago Public Library successfully applied for the competitive federal technology grant awarded through the Broadband Technology Opportunities Program (BTOP). The components of the 2 BTOP grants enable the Library to expand online information access to patrons with balanced and reduced waiting times by adding additional computers and learning opportunities at all library locations.  A Computer Commons area, comprised of more than 140 computers each, will be created at both the Woodson and Sulzer Regional Libraries to meet the needs of patrons. This addition will nearly triple the number of computers presently at each regional library.  YOUmedia, the Librarys innovative digital learning space for teens, will be expanded to the Thurgood Marshall (Englewood), Rudy Lozano (Pilsen) and the new Richard M. Daley (West Humboldt Park) branch libraries. YOUmedia in the neighborhood locations will serve both middle school and high school youth. This new technology enhances the approximately 3,800 public access computers systemwide, and free WiFi currently in operation at all library locations. Trained CyberNavigators or technology tutors work 20 hours each week in 47 branch libraries. For many years the Chicago Public Library has promoted digital excellence and access for all Chicagoans. Thanks to the Librarys free computers, tens of thousands of Chicagoans are able to conduct research via online databases or the Internet, and seek essential human services that are increasingly only available to those with access to technology. From January through November this year, all locations of the Library provided 2.8 million (an average of more than 254,000 per month) free Internet sessions to the public. An average of 41,000 patrons per month access the Librarys free WiFi system with their personal laptops or with laptops checked out for in-library use, a 20% increase over the same period last year. Downloadable ebooks, audiobooks, music and video continued to be increasingly popular in 2010. 115,077 items were checked out, via downloads from the Librarys website, www.chipublib.org, an increase of 38% from 2009. Begun in 2001 to national acclaim with To Kill a Mockingbird, One Book, One Chicago celebrated its ninth year with book selections Brooklyn by Irish writer Colm Toibin and A Mercy by Nobel Laureate Toni Morrison. Both were read, discussed and celebrated across the city. Additionally, the Library hosted both authors in person for free public programs. As with all One Book programs, CPL librarians created resource guides and conducted book discussions citywide. DePaul University, Steppenwolf Theater Company and a number of cultural institutions generously assisted the Library in presenting classes, programs and discussions relating to One Book, One Chicago selections this year. Through Money Smart, a citywide financial literacy initiative produced in cooperation with the Federal Reserve Bank and local financial institutions, the Library offers dozens of workshops for both teens and adults throughout the year in CPL locations all over the city. These programs teach Chicagoans how to be more financially savvy through presentations by financial experts and with books and other CPL resources. In its first full year of existence, the Librarys innovative teen space continued to grow in popularity with high school students and was hailed by the White House and the U.S. Department of Commerce as a national model of new learning. YOUmedia provides youth with the opportunity to learn anyplace, anytime in an interest driven, participatory manner through a unique mix of new media, librarians, mentors and curriculum. YOUmedia prepares our youth for 21st Century technologies and professions, and it originated at the Chicago Public Library with funding from the John D. and Catherine T. MacArthur Foundation and the Pearson Foundation. The popular Teen Volume program continued its focus on building new book collections and innovative programs for teens ages 1419. Working with a steering committee of librarians and teens from throughout the city, the program developed a Readers Theatre performance troupe, and continued to engage teens in book discussions in 45 branch libraries. The committee helps select new book titles for teen collections citywide and conducts online book discussions for teens. Teen Volume gets teens excited about reading, writing and discussing books and shows teens how the information resources at the public library can help them in school and in life. Teen Volume is made possible through a grant from the Chicago Public Library Foundation. Thanks to a generous grant from Kraft to the Chicago Public Library through the Chicago Public Library Foundation, the Kraft Great Kids Program continued to provide family admission passes to 14 Chicago museums for check out at our libraries, and fostered an ongoing partnership with the Chicago Park District. Under the Great Kids Read programs, Library services are brought directly to 12 Park District field houses during the school year and 24 unstaffed parks during the summer. The program brings librarians and park personnel together to promote participation in many library services and programs, including our annual summer reading program and emergent literacy programs for families. Partnering with the Art Institute of Chicago, the Library presented its annual summer reading programs for both children and adults. For the third year in a row, more than 50,000 children read a stunning 1.2 million books and approximately 6,000 adults participated in a variety of summer reading workshops, book discussions and gallery tours. Participants not only increased their reading skills, but also learned about the world of art around them  including the collection of the Art Institute of Chicago. On November 20th, the Library welcomed more than 6,000 children and parents to Bookamania, the Librarys annual celebration of childrens books. Bookamania invites young readers to meet authors, illustrators and storybook characters, as well as to participate in a variety of activities designed to encourage a love of reading. This annual event is funded this year by the Chicago Public Library Foundation and Target. The Librarys Get Wild About Reading Emergent Literacy Program and the Kraft Great Kids programs continued to show parents and caregivers how to make reading a family priority from birth. Monthly story programs conducted by librarians featured tips and strategies to introduce children to books and aided parents in establishing a language rich environment in their homes. CPL librarians reached out to early literacy programs across the city to herald the importance of reading aloud to children by conducting meetings and workshops for parents and teachers. The Look Out Kindergarten, Here I Come program continued as childrens librarians presented quality emergent literacy programs and materials to children and their caregivers in Head Start and State Pre-K programs. Bilingual bibliographies and finger play books were distributed through parent and teacher workshops conducted in designated libraries and Head Start Centers. Thanks to grants from the Chicago Public Library Foundation, in 2010 the Library maintained the Teacher in the Library program in 56 neighborhood libraries. Through the program, certified teachers are hired to work specifically on homework assignments with students every day after school, with special emphasis on improving math and reading skills. Jeu De Paume Brings Together Works for "False Friends / An Ephemeral Video Library"